Before I start with the recipe, I must address my tardiness in posting to my beloved food blog. “Was it something we did?” you might ask yourself. I will respond we a resounding NO!!! It isn’t you, it’s me. It was a much needed break, and I have returned feeling rested, recouped, revived, and reinvigorated! My fingers are ready to type and my mind is tripping over itself with tantalizing recipe ideas. While I was gone, we had a baby! Yep, a bouncing baby boy that is nearly 9 months old. He is happy, healthy, and just a joy to be around. While I spend a good deal of time pureeing, I am cooking a few ‘solids’ for his dad and I to enjoy. I’m back, and I hope you will be too! Back to the post at hand…I was trying to come up with a salad dressing that is both homemade, and quick to prepare (my priorities have changed a bit). This salad dressing recipe fits the bill! Enjoy this three ingredient salad dressing. 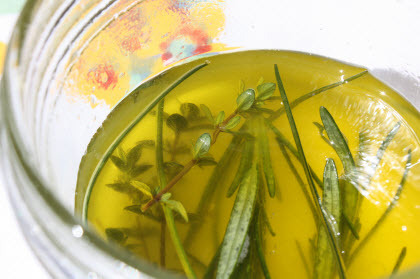 In a small covered dish combine the olive oil, lemon juice, and herbs. Let steep for an hour or two at room temperature before using. Strain, and enjoy over any greens of your choosing.